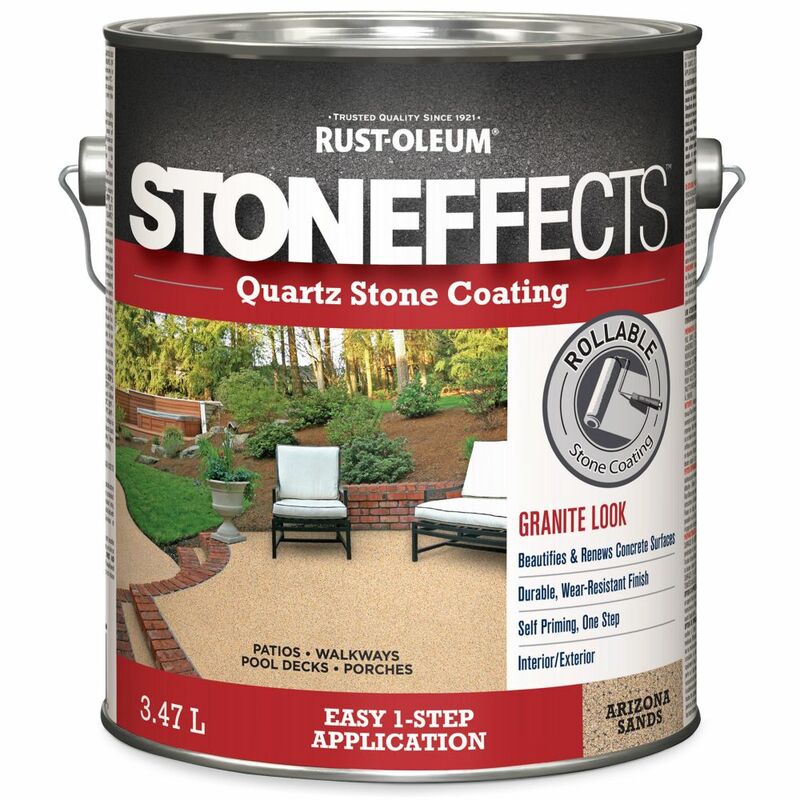 STONEFFECTS QUARTZ COATING is a self-priming quartz coating with excellent top coat adhesion and weather resistance. Stoneffects creates an attractive, decorative quartz finish which is highly durable and impact resistant withstanding the rigours of harsh weather and daily wear and tear. Stoneffects has the added benefit of creating a non-slip surface that is flexible and highly resistant to abrasion and impact. Use of a unique stoneffects quartz coating roller is required for proper application. This 100% acrylic latex, mildew resistant finish is available in two sheens, Low-Lustre and Gloss. These products resist scuffing, fading, cracking and peeling while providing a durable, long lasting finish that is ideal for both interior and exterior applications. Low-Lustre Enamel is ideal for porches, floors, decks, basements and patios. BEHR Premium Granite Grip is a unique decorative, slip-resistant concrete floor coating. It helps renew and provide a multi-speckled, protective finish. It will hide surface imperfections and fill in hairline cracks in concrete. It is easy to apply for interior and exterior concrete and masonry surfaces. It is available in pre-mixed and custom colours. A revolutionary paint and primer in one, BEHR PREMIUM PLUS ULTRA<sup></sup> is made with the finest raw materials and was developed using NANOGUARD<sup></sup> technology for a dense, hard, durable paint film. BEHR PREMIUM PLUS ULTRA is liquid protection for your home. Glidden Premium exterior paint + primer is ideal for all exterior siding, eaves and downspouts. Specially formulated with 100% acrylic to protect against UV rays, colour fading and all weather conditions. For more than 140-years, painters have trusted Glidden and Glidden paints to help them turn inspiration into action to add colour to their lives and Glidden Premium delivers on this tradition with a durable finish at an exceptional value. Quartz Stone Coating Arizona Sands 3.47L STONEFFECTS QUARTZ COATING is a self-priming quartz coating with excellent top coat adhesion and weather resistance. Stoneffects creates an attractive, decorative quartz finish which is highly durable and impact resistant withstanding the rigours of harsh weather and daily wear and tear. Stoneffects has the added benefit of creating a non-slip surface that is flexible and highly resistant to abrasion and impact.